There are many things that I’m passionate about…hunting for wild mushrooms and edibles, tennis, cooking good food, but at the top of the list, without a doubt is fly-fishing and fly-tying. I am a co-owner of a small bakery in Underhill so my “day job” is spent indoors in the bakeshop. At almost all other times, though, you’ll find me outside fishing. I grew up in the suburbs of northern New Jersey and couldn’t have imagined then how much fishing and spending time outdoors would occupy my later years. The journey began in my late twenties after a move from the city to the north country of Coos county, NH. I had decided to give up my partying ways and live a sober life. Spending time in the woods and being on the river helped me clear my head. One day while I was “drowning worms” in the Israel River, I saw a one-armed man land a trout using an automatic reel! I was not familiar with fly fishing (with or without an automatic reel) and asked if I could watch him for a bit. He was so generous with his time and energy and I was so mesmerized while watching him cast that I went out the next day and bought a fly outfit. And the rest is history. I started tying flies shortly after that, mostly because I was tired of giving “my $5.00 donation to the river” every time I went out. I have a degree in fine arts and have always loved creating things, so fly-tying is a perfect fit. I ultimately moved to Vermont and got great guidance from the gentle men at Classic Outfitters in Burlington and currently tie with the Trout Unlimited tying club and with Brian Zinger and his club in Essex Junction. I mostly fish for trout but will cast for anything with fins. I try to get on the salt at least once a year… bonefish in the Bahamas, tarpon in the Keys, and I’ll usually try my luck on Cape Cod when I head down for some time on the beach. 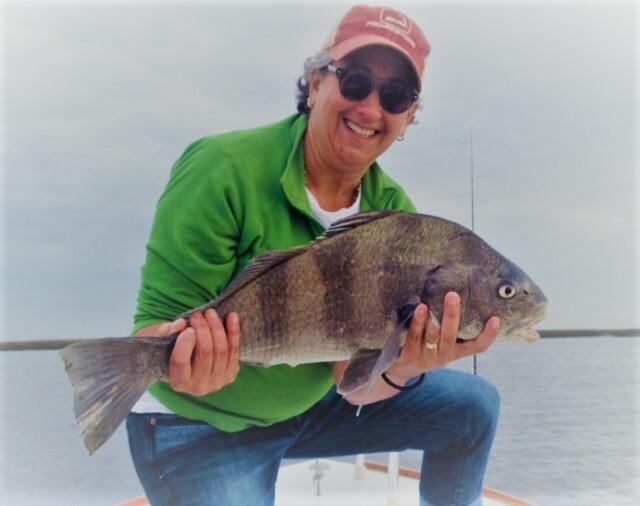 I’m relatively new to the “fishing guide life,” but since I have spent most of the last 20 years as an instructor of culinary arts at the New England Culinary Institute and at the Community Kitchen Academy, teaching comes naturally to me. Fishing was, and still is, a way to find solitude and serenity after a hectic day in the kitchen and classroom. I love to teach what I know and help others find their way through complex processes, and I am excited to be finding a place as a mentor/teacher in the fly fishing community. I’m happy to work with anyone who’s interested but I especially want to help encourage other women to discover the joys of the sport. I’m psyched to see where the river will take me!